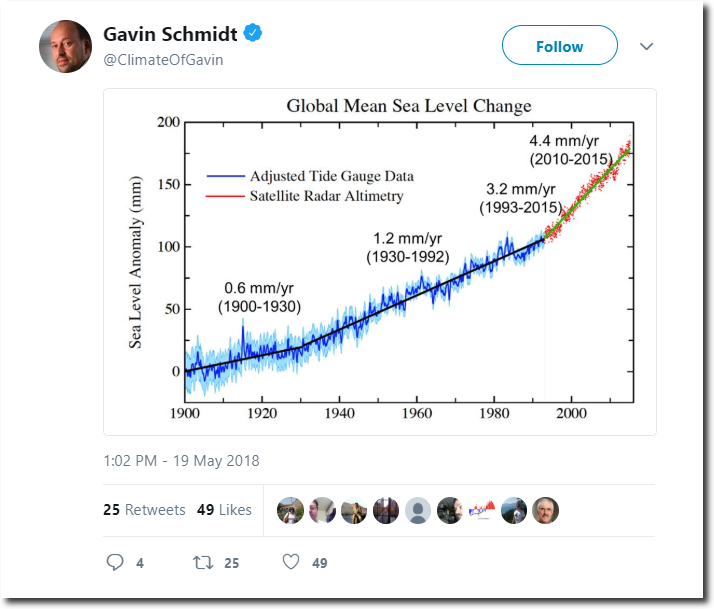 No longer satisfied with pushing temperature fraud, Gavin is now pushing sea level fraud. Amazing how a break in slope appears when they switch methodologies from tide gauges to satellites, including adding a completely fake GIA (global isostatic adjustment) – which if it was legitimate, would have been equally valid for the tide gauge measurements. Gavin is claiming a 250% jump in sea level rise rates on the exact date when they switched methodologies, and a further jump after 2010. There is not one tide gauge on Earth which shows this break in slope. Here is the tide gauge by Gavin’s office. There is no increase after 1993, and since 2010 sea level has fallen. The level of fraud in climate science makes Enron accountants look like saints.